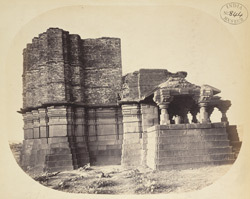 This photograph showing the side of the porch of a ruinous temple at Kothali in Central India was taken by Robert Gill in 1871 and forms part of the Archaeological Survey of India Collections (India Office Series). The location is given as 'Jaypur Kotli' in Bloch's list, 14 miles north of Buldana, where there are two old temples of which this is one. The ruined sanctuary tower is constructed of brick whilst the lower portion of the sanctuary, antechamber and porch are of dressed masonry. The temple is almost entirely devoid of carved decoration, and that which is present is confined largely to non-figural motifs. The figure of Ganesh over the shrine doorway and three figures, including that of Shiva, to either side of the entrance, are exceptions to this general trend.